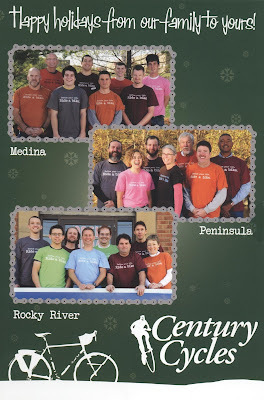 Century Cycles Blog: Check your mailbox for CC greetings! This week we mailed our holiday coupons, so check your mailbox for a card that looks something like this. Not on our mailing list? Perhaps the card wasn't delivered by your overworked mail carrier? Then stop in any store and we'd be happy to give you one! In addition to greetings, pictures of the best employees ever, and coupons, it also includes our 2009 Night Rides on the Towpath Trail schedule and a heads-up on a very, very, very good reason to sign up to receive our eNewsletter this winter.